Last week, co-workers and I celebrated author Gretchen Rubin, by grabbing dinner, drinks and then attending the presentation, Q&A and book signing dedicated to her new book, Happier at Home. 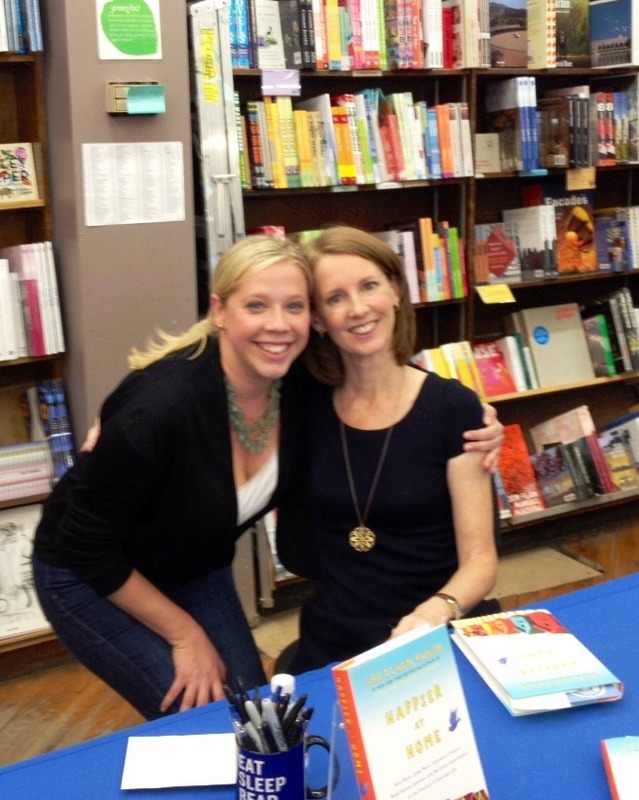 This delightful evening with Gretchen was organized by Brookline Booksmith, my absolute favorite book store in Boston. The Booksmith has that warm “Shop Around the Corner” feel that makes everyone feel welcome, hosts world renowned authors AND most importantly they are dog friendly. Yes, Kristian & Sadie even came down and helped me snag a photo of Gretchen and I together at the end of the night. I read Gretchen’s first project themed book called The Happiness Project and fell in love with her creative and simple tips for truly embracing your experiences, free time and relationships. In fact, her book is the reason I had the initial idea to start the Celebrate Everyday blog with Becky and Holly! I will be diving into Happier at Home in the coming weeks and will be sure to report on my overall review. In the meantime, if you would like to check out what The Happiness Project is all about, check out Gretchen’s website, blog, etc. Do you have a book that has spoken to you in the past year or so? If so please share! Wishing you a happy reading season. Posted in JubileeTagged Book signings, Books, Brookline Booksmith, Gretchen Rubin, Happier at Home, The Happiness ProjectBookmark the permalink. this blog is goin’ to the dogs!